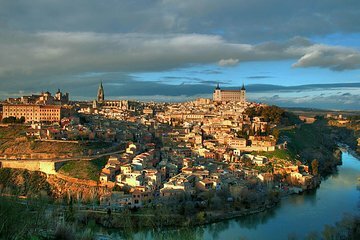 Explore the medieval hilltop city of Toledo on this half-day tour from Madrid. Learn about landmarks like the Cathedral of Saint Mary, Town Hall Plaza and Justice Palace from your knowledgeable guide on a walking tour of Toledo’s walled historic center, and take in panoramic views of the surrounding landscape. Upgrade to include a sightseeing tour of Madrid’s city center, or opt for a night of traditional Spanish culture with a live flamenco show. The tour was a beautiful sight to see. Tour guide was also nice and knowledgeable. The route is a lot of walking so definitely come in comfortable walking shoes and have a charged phone for beautiful pics. Very knowledgeable tour guide and incredible driver: Fatima. Very accommodating. We only wish the tour had been longer and the Flamenco Show had been a part of it, not a choice - because we heard it was really great and are sorry we missed it. On our way out of the City we really wished we had seen the other half of the City including the Cathedral which I think should not have been missed. Toledo is a beautiful city. The architecture and views are incredible. Going on a guided tour was a good choice because we got to hear about the historical importance of the groups who settled there. We chose to go by bus and it was a comfortable ride and out tour guide was great. We did stop at a shop or two but they made good bathroom breaks. The items they sold were touristy. I highly recommend seeing Toledo. The Flamenco show was good as well. The dancers and musicians were professional and accomplished. I had seen a Flamenco show previously in Granada and we were told the history and meaning of the dances. This was not done in the Madrid show and it would have been nice because my two friends had never seen a show before. All in all, great tour. This needs more work! Never able to use the bathroom, get food or drinks until the very end when they brought us to a factory which in my case didst even seem real. Food there was none, drinks in a vending machine. Drop off was a joke! We were never told there would only be two stops, and there was no one to talk to us either in English! The bus driver didn't understand, dropped us off 5-6 blocks completely out of our way from our hotel. Would not recommend until the improve this!